The Fantastic Beasts Newt Scamander Scarf includes the striped Scarf as pictured. Gear up to discover mythical creatures as Newt Scamander from the fantasy world of Fantastic Beasts and Where to Find Them. This Scarf will help you replicate Newt’s iconic look for your next Cosplay Convention, Comic-Con, or for Halloween. 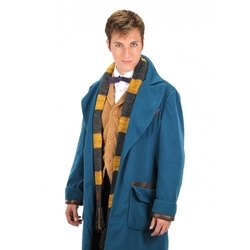 Pair with our other Newt Scamander accessories to complete the look!